Coach Kev is a highly motivational, knowledgeable, high energy trainer with over 15 years of field experience training adults in weight loss or building lean muscle tissue as well as training young athletes to increase their speed and agility all the way through their competitive careers. 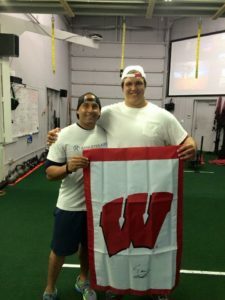 He has trained thousands of athletes up into the collegiate and professional level in numerous areas of expertise. His certifications include NASM, PARISI speed school, TRX, kettlebell, Olympic lifts, IFA group fitness, COORDS, and CPR. Formerly Senior Sports Performance Practitioner at Athletes Arbor, Strength and Conditioning Coach at Oceanside Wellness, Speed and Agility Coach at East Coast Speed Academy, and CPT at Exodus Integrated Wellness, now proud owner of Exodus Sport and Fitness. Whatever you are training for Coach Kev will help you reach your goals and add an element of education and fun in the process. Born and raised here in Ocean City, She is excited and passionate about making our community a happy and healthy place to be. She is an NASM Certified Personal Trainer and has been involved in sports and fitness her entire life. She believes leading a healthy lifestyle and getting in shape shouldn’t feel like a chore but, should be a positive journey that challenges you and leaves you feeling accomplished. 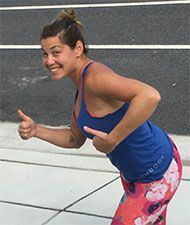 Taylor knows we all love to spend time running, biking, or walking the beautiful boardwalk of OC, but she says “if you want to amp up your routine Exodus is the perfect place to go” she will personalize the workouts based on your specific goals and always make it fun. She is currently continuing her education in Physical Therapy. 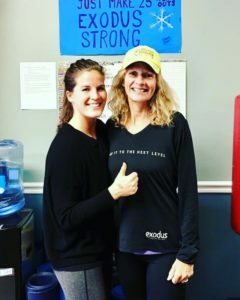 She feels that everyone should experience how invigorating it feels to sweat and become stronger with each workout, and She is here at Exodus to help you reach your goals! Jen aka Jenergy has been in the fitness industry for over 7 years. She is a Wife, mom of 2 and an all around fitness enthusiast. Jen has been active her entire life playing sports, playing softball, flag football and surfs. She holds many licenses and certifications and is always continuing her education. Jen is well known for her Zumba classes (where her journey began) and her high energy classes. She loves to bring fun into the classroom and keeps the Jenergy flowing. You will always find her dancing and laughing in every class. Jen recently graduated from Barberio School of Massage Therapy where she received the clinical award. Jen believes Fitness, Nutrition, and Massage go hand in hand and it’s crucial to take care of the body you have. Shannon Sloss is a recent graduate of the University of Louisville. She graduated with a BS in Human and Health Performance with a major in Exercise Science and a minor in Wellness Coaching. She is a passionate and knowledgeable individual who wants to help you reach your fitness goals and get healthy. She is IFA group fitness certified and currently working on The NASM and CSCS certifications. 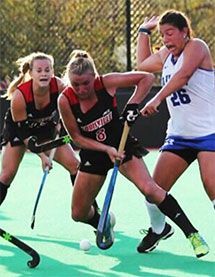 She has a great strength and conditioning knowledge due to being a Division 1 Field Hockey player for Louisville. She is eager to help the young athletes in town and those vacationing here as well. Shannon can help your young athlete in all aspects of their game while also improving their health!